The text below is also available as a pdf. A question that almost always comes up when Christians talk about dinosaurs is, Are dinosaurs mentioned in the Bible? Many people say yes, many say no, so who's right? This page is dedicated to searching the Scriptures to see what it says, if anything, about dinosaurs. For starters we should note that the word dinosaur, which means terrible lizard, was not coined until 1842. That was 231 years after the King James Bible was translated. Since virtually all English versions are heavily influenced by the language of the King James, we do not find the actual word dinosaur in any passage in any English Bible. That said, many have said that the Bible does talk about dinosaurs either indirectly or under different names, so lets explore the passages often cited as evidence to see if those claims hold up. What was the serpent in Genesis 3? The Young-Earth Creationist (YEC) organization Answers in Genesis (AiG) has stated they believe the Bible describes a dinosaur like brachiosaurus when God describes the behemoth to Job. Some people would agree with this theory, but others have said this likely refers to a more common creature like an elephant or a hippopotamus. Before we dig into the identity of the behemoth, we need to read the passage in the Bible. There is a great deal of mystery surrounding the identity of behemoth. 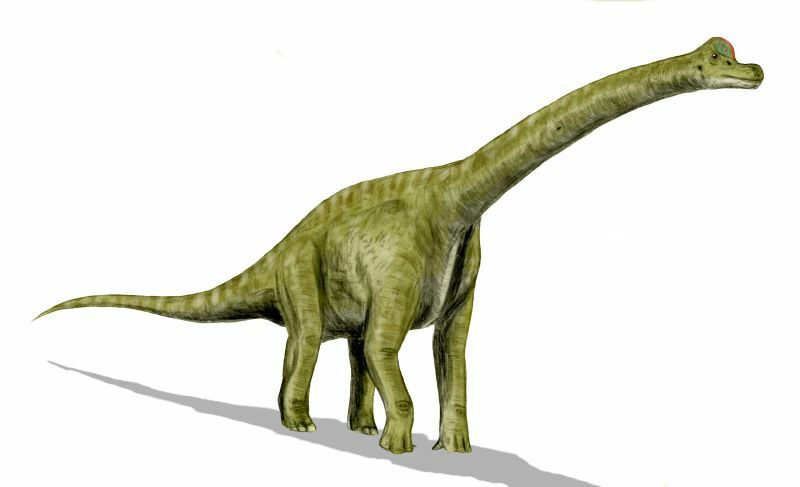 From the description above it is certainly understandable for people to claim it is one of the larger sauropod dinosaurs. And this is the only undisputed place in Scripture where behemoth is mentioned, which adds to the uncertainty (according to the Brown-Driver-Briggs Hebrew and English Lexicon, Ps. 73:22 is another strong possibility with its singular pronouns see below). Now that we've read the biblical description, let's consider the literary nature of the Book of Job. When interpreting the Bible, I take the stance that we should always interpret what it says literally, unless it tells you not to, or it's obvious from the literary style employed that it should be taken figuratively. The Book of Job falls into the genre of poetry. As such, it often portrays exaggerated speech that is not to be taken literally, as opposed to, say, a narrative where someone is describing events that actually occurred with the intent of portraying an accurate chronological account. That this is an exaggerated description and not an actual literal description should be obvious from the text in places where it says things like His bones are tubes of bronze, his limbs like bars of iron (v. 18). Certainly, this creature was not made of bronze and iron. The author is speaking metaphorically. He wishes us to associate the limbs of behemoth with bronze and iron, symbols of great sturdiness and strength. The use of metaphors in biblical poetry is quite common. Other examples where it is silly to take them literally are in Deut 32:4 where God is a rock, in Song 4:4 where the womans neck is like the Tower of David, in Ps 61:4 where God has wings, in Prov 28:15 where a wicked ruler is like a charging bear or roaring lion, in Prov 21:1 where the kings heart is a stream of water, and many, many more. That said, there are some great nuggets of literal truth here, such as 1.) it eats grass, 2.) its strength is in its loins, 3.) its tail is strong, like cedar, 4.) its limbs are strong, like iron and bronze, 5.) it is the first (or, chief) of the works of God, 6.) it shelters in the marshes and (Jordan) rivers, 7.) it is difficult to tame. Our guess as to what this creature is or was must fit these criteria. Before we go into breaking down the text to try and figure out behemoth, lets now look to see the views of the scholars, translators and commentators. The following 18 resources hold that behemoth is a hippopotamus (Easton's Bible Dictionary, Tyndale Bible Dictionary, New Bible Dictionary 3rd edition, Eerdeman's Bible Dictionary, Harpers Bible Dictionary, Holman Illustrated Bible Dictionary, Bible Knowledge Commentary, New Bible Commentary 21st Century Edition 4th edition, Be Patient, Bible Guide, Wiersbe's Expository Outline on the Old Testament, The Wisdom Literature and Psalms, The Teacher's Bible Commentary, Apologetics Study Bible, Nelson Study Bible, ESV Study Bible, Theological Wordbook of the Old Testament (TWOT) and Brown-Driver-Briggs Hebrew and English Lexicon (BDB)). Additionally, the New Living Translation (NLT) 1st edition (1996) directly translated behemoth as hippopotamus (this was subsequently changed in the 2004 2nd edition to the transliterated behemoth). The New American Standard Bible (NASB) includes this interpretation in a footnote. Matthew Henry's commentary suggests it was an elephant, as do footnotes in the Authorized Version (AV) of 1873, and the King James Version (KJV) of 1900. The Holman Concise Bible Commentary and the Archeological Study Bible interpret this creature as either a hippo or an elephant, as is in the footnote in the New International Version (NIV). The Commentary Critical and Explanatory on the Old and New Testaments claims this to be an Egyptian water ox. The Wilmington's Bible Handbook, Defender's Study Bible and MacArthur's Study Bible say this describes a dinosaur. Most scholars and commentators believe the creature called behemoth in Job 40:15 is a hippopotamus (image uploaded to Wikimedia Commons by Lee R. Berger). The majority of these resources hold that behemoth was some kind of creature we are familiar with today; most say the hippopotamus. Only three of them claim that this was a dinosaur. One of the three, Defender's Study Bible, is a compilation of notes by the late Henry Morris, who was the pioneer of the recent young-earth creation science movement with his work on the Genesis Flood in the early 1960s. Without a doubt, his research has influenced any recent scholar, and certainly any organization like Answers in Genesis or the Institute of Creation Research (founded by Henry Morris in 1972 and now run by his son, John Morris) who would suggest behemoth to be a dinosaur. These claims are obviously recent, so now we will go back to the text and look closely at it, and the ideas put forth before 1842, when the dinosaur excitement began. If behemoth was a dinosaur, it should be evident in these older resources as well. To start, we see that the word behemoth is just a transliteration of the Hebrew word. The Hebrew behemoth is an extension of the plural of behema akin to the superlative in the English. As such, it refers to a large beast, the brute beast par excellence (Theological Wordbook of the Old Testament, TWOT). According to TWOT, the behema can be a wild animal, but it mostly refers to larger domesticated animals such as sheep and cattle. The plural behemoth is used 15 times in the OT, but this should not be confused with our word behemoth here in Job 40:15. In most other cases it is clear it refers to multiple creatures. In the description of the behemoth in Job, the pronouns are all singular (he-his), meaning this is referring to one large creature (cf. Ps 73:22). A similarity is seen with the plural Hebrew word for gods (elohim) also being used for the singular, majestic Creator God. The early Greek translation of the OT, the Septuagint (LXX), translates behemoth as therion. Therion is a word usually depicting a wild animal or beast. It is found 165 times in the LXX. These were the beasts of the earth God made on Creation Day 6 in Gen. 1:24-25. They were the beasts with Noah on the ark (Gen 8:1) as differentiated from the livestock (Gr. ktenon) (cf. Lev. 25:7). It was the fierce animal Joseph's brothers claimed had eaten him in Gen. 37:20, 33. These and other passages make it clear that the Jewish scholars who translated the LXX in the first few centuries BC thought behemoth was a wild animal with which they had some degree of familiarity. Behemoth is also mentioned in a few apocryphal and pseudepigraphical books (~200 BC to 200 AD). These are apocalyptic in nature and seem to mythologize the creature. The references to behemoth in these non-canonical books are found in Enoch 60:7-9, The Apocalypse of Baruch (or Baruch 1) 29:4, and potentially 2 Esdras (4 Esdras) 6:49-52. In 2 Esdras, the Latin is the primary source text since the original (either Hebrew or Greek) is non-extant. The Latin reads Enoch instead of behemoth as followed by the KJV Apocrypha. The Syriac reads behemoth, however, as followed by the RSV-NRSV Apocrypha. It is uncertain which is the original wording, but since it is coupled with leviathan, it is probable that behemoth is correct. To sum these non-biblical works up, behemoth was created on the 5th Creation Day, assigned to the land portion (as opposed to the other monster leviathan, who was assigned to the watery abyss), and his carcass will be given to those who survive in the times of the Messiah. It appears these writings treat leviathan and behemoth as mythical creatures, certainly not ones Job would have been familiar with as they wereplaced in seclusion until the end times. The Latin Vulgate (405 AD), Luther's German Bible (1534) and the King James (1611) avoid any interpretation of behemoth by simply transliterating the word behemoth. Luther does make a note by behemoth that reads ein Riesentier, nach der Art des Nilpferds (a behemoth, according to the nature of the hippopotamus), which clearly indicates he felt the creature was real and in existence in his time, even specifying it by name. A few commentators hold that the behemoth was an elephant (image by Fir0002/Flagstaffotos according to the GFDL license). Of all these resources which predate the word dinosaur, it appears most feel it was a mighty, but familiar creature, whether a hippopotamus or an elephant or something else. The non-biblical books contradict Scripture where God tells Job to Behold, behemoth in Job 40:15. How could he behold a creature which was in seclusion until the end times? Or how could a mythical creature be in the Jordan River (Job 40:23)? But could it have been a dinosaur? We will now judge from the description given in the passage in Job above. There are really two objections to this being a hippo or an elephant by those who claim this to be a dinosaur. They are the tail like cedar (v. 17), and the idea that the hippo is not found near the Jordan River (v. 23). First, the Hebrew word here for tail is zanab. This word can mean a literal animal tail like a serpent's (Ex. 4:4) or a fox's (Judg. 15:4), or it can mean a figurative stump or lowest in rank (Deut. 28:44; Is. 7:4). 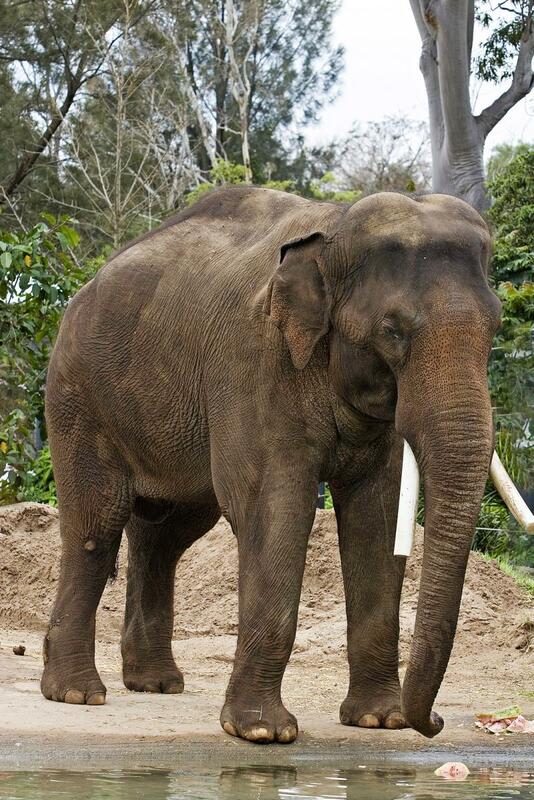 TWOT also suggests it could mean any appendagesuch as the trunk of an elephant? Another possibility lies in the Hebrew word pachad (thigh) in verse 17. This word is only used like this here in Job. It is possible that the zanab is not a tail but a phallus, and the thighs are the creatures stones (KJV) or testicles (Latin Vulgate testiculorum). This would be another symbol of the creatures strength as he makes his zanab stiff like a cedar; perhaps meaning it is not always in that state. Certainly this could either be describing an elephant with its trunk, or a hippopotamus, whos strength is in his loins, and his power in the muscles of his belly (v. 16). This objection over the tail of behemoth is fairly easily explained on textual bases, and certainly does not give evidence it speaks of a dinosaur. The second objection is that there are no hippopotami near the Jordan River today. While thats true, Belmaker (2006) states that hippopotamus antiques has been described in Pliocene deposits near Bethlehem, hippopotamus behemoth (who's fossils have been found in the Central Jordan River Valley just south of the Sea of Galilee) was an endemic and common species in the Levant since the lower Pleistocene, and hippopotamus amphibius was in the Levant until around the 4th Century BC. Even though there are no hippopotami in Israel today, there is abundant evidence that they were there even in Job's day (~2000 BC). Those wishing to make the behemoth out to be a dinosaur have often overlooked other pieces of evidence in the account given in Job. First, he eats grass (v. 15), which would be difficult to do for a huge sauropod. Second, reeds and lotus plants (v. 21) would hardly be shelter for a large sauropod dinosaur. Third, dinosaurs have not been noted around the Jordan River (v. 23). Dinosaur footprints have been discovered in the Israeli town of Beit Zayit (about 7km west of Jerusalem). They were most likely from the dinosaur struthiomimus and were formed in the late Cretaceous Period. This clearly pre-dates Job, but this poses no threat to the Young-Earth Creationist who would say these rocks were formed during Noah's Flood. The problems though are how there are any footprints formed in a global Flood in the first place, and, these prints were left by a theropod, not a sauropod. This dinosaur was not the dinosaur the YEC would claim to be behemoth. Fourth, the Jordan River is said to rush against his mouth (v. 23). As the Bible Knowledge Commentary rightly states, A surging river would hardly reach the depths of a brontosaurus mouth. Another problem is the explanation of how this could be the first (or, chief) of the works of God (v. 19) and now be extinct. Hippos and elephants are still around, but dinosaurs are not. If this was God's most powerful and awesome creature, one would think it would have survived, especially if it was carried through the Flood on the ark, as the YECs claim. The problems with behemoth being a dinosaur seem insurmountable. The most likely explanation for this creature is that he was real, not mythical, and that he was familiar to Job. While we cannot be absolutely certain, the most likely suspect that fits the description is that of the hippopotamus, second, perhaps, is the elephant. 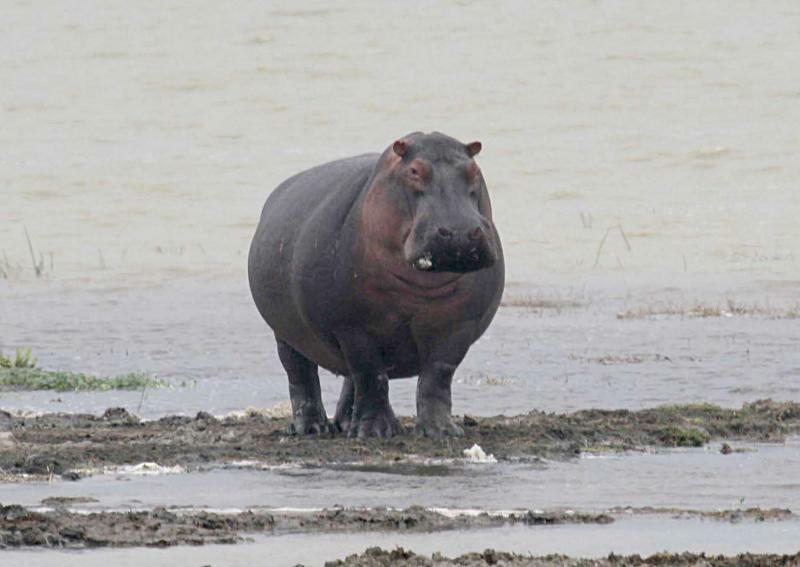 It seems very plausible that a large species of hippopotamus was located around the Jordan River in Job's day, but has since migrated away due to environmental changes. Additionally, we cannot escape the implication of claiming this to be a dinosaur, namely that dinosaurs and humans lived at the same time. We will explore this idea on another page. We will now turn our attention to the next creature: leviathan. Similar to the discussion above on behemoth, we will begin to look into the identity of leviathan by starting with the most famous and descriptive of all the biblical passages that mention this creature. remember the battleyou will not do it again! for him sling stones are turned to stubble. 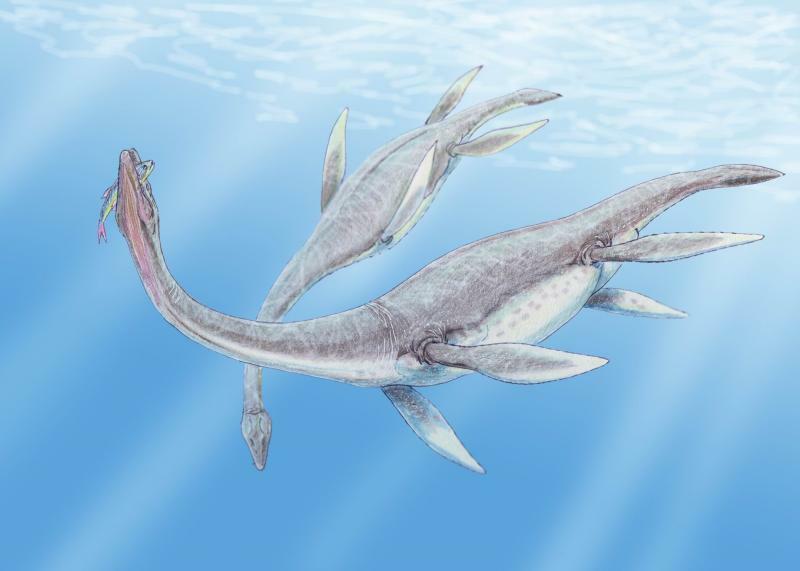 Some feel that this description in Job 41 refers to an aquatic dinosaur such as this plesiosaurus (illustration by Dmitry Bogdanov published on Wikimedia Commons under the GFDL license). Like the preceding passage on behemoth, it is easy to understand why some people, and organizations like Answers in Genesis, feel this is describing a dinosaur or some kind of mythical creature such as a dragon or giant sea monster. Before we discuss the viability of this interpretation, we will again need to keep a few things in mind. First, this passage in Job falls into the literary genre of poetry. As such, it often employs the use of metaphors and other exaggerated speech, and is not necessarily intended to give an accurate physical account of a literal event, or a literal description of an object (see above discussion). Second, since the word dinosaur was coined in 1842, we will need to focus more time on the sources that predate this event to avoid any cultural or emotional bias. If leviathan was a dinosaur, it should be clear, even from referencing these older sources. With that said, let us now see what the translators, commentators and scholars have to say about this awesome creature. The following 16 resources hold that leviathan was a crocodile (Easton's Bible Dictionary, New Bible Dictionary 3rd edition, Eerdeman's Bible Dictionary, Tyndale Concise Bible Commentary, Bible Knowledge Commentary, New Bible Commentary 21st Century Edition 4th edition, Be Patient, A Commentary Critical and Explanatory on the Old and New Testaments, Wiersbe's Expository Outline on the Old Testament, The Wisdom Literature and Psalms, The Teacher's Bible Commentary, Apologetics Study Bible, New Nave's Topical Bible, ESV Study Bible, Theological Wordbook of the Old Testament (TWOT) and Brown-Driver-Briggs Hebrew and English Lexicon (BDB)). Additionally, the New Living Translation (NLT) 1st edition (1996) directly translated leviathan as crocodile (this was subsequently changed in the 2004 2nd edition to the transliterated leviathan). The New American Standard Bible (NASB), New Revised Standard Version (NRSV) and New International Version (NIV) include this interpretation in a footnote. The Tyndale Bible Dictionary, Harper's Bible Dictionary, and the Holman Illustrated Bible Dictionary state it is a great (mythological) sea monster. Matthew Henry's commentary suggests it was a whale, as do footnotes in the Authorized Version (AV) of 1873, and the King James Version (KJV) of 1900. The Holman Concise Bible Commentary interprets this creature as a mythical dragon. The Wilmington's Bible Handbook, Defender's Study Bible and MacArthur's Study Bible say this describes an aquatic dinosaur (MacArthur even narrows this down to a kronosaurus). Most modern commentators hold that leviathan in Job 41 is a crocodile (image uploaded to Wikipedia by MartinRe and published under the GFDL license). In studying the name leviathan, it seems that the historical perception of this word and how it should be translated and understood is as twisted as the name itself implies. The Theological Wordbook of the Old Testament (TWOT) states that the word is derived from a root attested in Arabic, lwy 'to twist'. That is why it is traditionally thought of as a creature that could twist. The Hebrew word, leviathan, is used 6 times in the OT. In addition to describing a literal animal, it is used figuratively for Egypt (Ps. 74:14), and for sinful mankind in general (Is. 27:1 2x) (TWOT). The three non-figurative uses are found in Ps. 104:26, Job 3:8 and here in Job 41:1. From these occurrences it is very difficult to identify the leviathan. The only clues are in the exaggerated description in Job 41 (see below), and that it plays in the sea (Ps. 104:26). As will be evident below, this vagueness has led to much confusion and inconsistency among early translators of the Hebrew Scriptures. The Greek translation of the OT in the first few centuries BC, the Septuagint (LXX), is mixed in how it translates the word. In Job 41:1 (LXX-40:25), the LXX translates leviathan with the Greek word drakon (dragon). It also uses drakon in Ps 74:14 (LXX-73:14); 104:26 (LXX-103:26); Is 27:1 (both times, although drakon is used a third time for the word 'dragon' as well Heb. tannin). In Job 3:8, however, the LXX uses kete (large fish). Before one concludes this as consensus that the LXX translators saw leviathan as a dragon the same way we see dragons in mythology, it should be noted that they employed drakon in other places that muddy the waters a bit. For instance, in Ex. 7:9-10, 12, it used for the serpent that Moses' staff turned into (Heb. tannin); the serpent that will be trampled underfoot in Ps. 91:13 (LXX-90:13; Heb. tannin); the great sea creatures (plural) in Ps. 148:7 (Heb. tannin); the young lions in Job 4:10, 38:39 and Lam. 4:3; the cobra in Job 20:16; the jackals in Jer. 9:10 and Micah 1:8; and the male goats in Jer. 27:8. As you can see, the LXX translators were fairly liberal in their use of drakon. Not only did they not use it every time for leviathan, they even employed it for multiple Hebrew words. Additionally, they even used drakon for 'young lions', 'male goats' and 'jackals' (although the jackals occurrences can be explained away by them misreading the Hebrew word tannim (jackals) as tannin (sea monster)). The only conclusions that can be drawn from the LXX study of leviathan is that either the translators were unsure of its identity, or that they considered it to be an ordinary creature that was in some cases mythologized in certain poetic instances. It appears they also felt it to be synonymous and interchangeable with the creatures rahab and tannin (see below). Interestingly, the Dead Sea Scroll 11QtgJob, written in Aramaic, reads tannin instead of leviathan in Job 41:1. This targum (or, translation) dates to around the 2nd Century BC. The Jewish translator could have used the Aramaic transliteration lwythn as is written in the Antwerp Polyglot of 1570, but for this passage chose to interpret the creature as tannin. This goes along with the Greek translators who seem to view these different names as referring to the same creature or creatures. 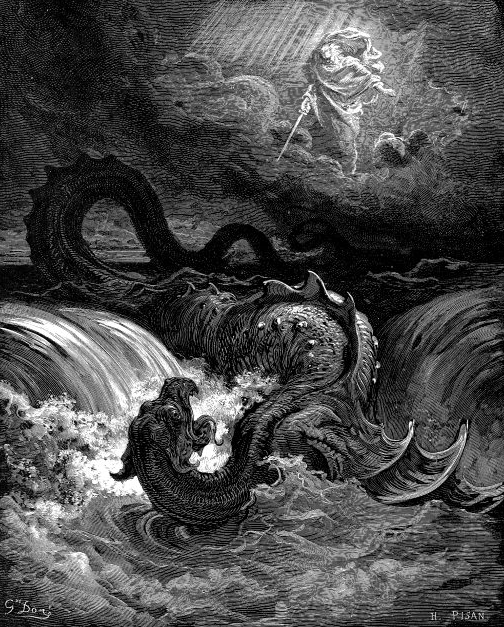 "Destruction of Leviathan" by Gustav Dore (1865) (image from Wikimedia Commons). In the Apocryphal literature (~200 BC 200 AD), as seen above, leviathan is mentioned along side of behemoth in a few passages (Enoch 60:7-9, The Apocalypse of Baruch (or Baruch 1) 29:4, and 2 Esdras (4 Esdras) 6:49-52). To sum these non-biblical works up, leviathan was created on the 5th Creation Day, assigned to the watery abyss (as opposed to the other monster behemoth, who was assigned to the land portion), and his carcass will be given to those who survive in the times of the Messiah. It appears these writings treat leviathan and behemoth as mythical creatures, certainly not ones Job would have been familiar with as they were placed in seclusion until the end times. The Latin Vulgate (405 AD), Luther's German Bible (1534) and the King James (1611) avoid any interpretation of leviathan by simply transliterating the word leviathan. Luther does make a note by leviathan next to the word in Job 3:8 that reads ein Riesentier, nach der Art des Krokodils (40,25) (a behemoth, according to the nature of the crocodile (40:25, or 41:1 in English Bibles)), which clearly indicates he felt the creature was real and in existence in his time, even specifying it by name. Whether this leviathan be a whale or a crocodile is a great dispute among the learned, which I will not undertake to determine; some of the particulars agree more easily to the one, others to the other; both are very strong and fierce, and the power of the Creator appears in them. The ingenious Sir Richard Blackmore, though he admits the more received opinion concerning the behemoth, that it must be meant of the elephant, yet agrees with the learned Bocharts notion of the leviathan, that it is the crocodile, which was so well known in the river of Egypt. I confess that that which inclines me rather to understand it of the whale is not only because it is much larger and a nobler animal, but because, in the history of the Creation, there is such an express notice taken of it as is not of any other species of animals whatsoever (Gen. 1:21, God created great whales), by which it appears, not only that whales were well known in those parts in the time of Moses, who lived a little after Job, but that the creation of whales was generally looked upon as a most illustrious proof of the eternal power and godhead of the Creator; and we may conjecture that this was the reason (for otherwise it seems unaccountable) why Moses there so particularly mentions the creation of the whales, because God had so lately insisted upon the bulk and strength of that creature than of any other, as the proof of his power; and the leviathan is here spoken of as an inhabitant of the sea (v. 31), which the crocodile is not; and Ps. 104:25, 26, there in the great and wide sea, is that leviathan. Matthew Henry agrees with some learned scholars of his days that the leviathan is a large whale (image credit: NOAA). Matthew Henry considered leviathan a whale, as some modern scholars hold, but mostly because of the King James translation of tanninim in Gen. 1:21 as 'whales'. This was changed in the New King James Version, incidentally, to 'sea creatures'. 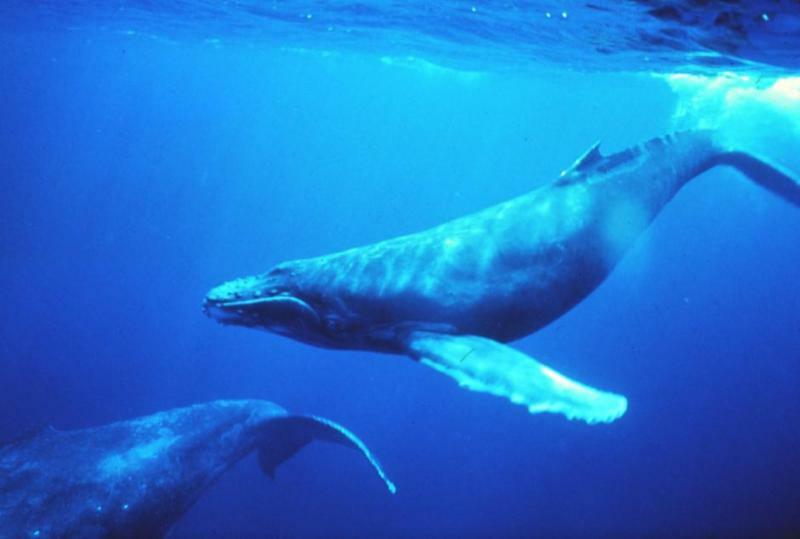 It is strange that, as it seems, leviathan and tannin are interchangeable, but yet the KJV translators were willing to interpret tanninim as 'whales' in Gen. 1:21. Perhaps they were influenced by the LXX reading kete (large fish, cf. Jon. 2:1-2; 2:11). In any case, it is clear Matthew Henry and the learned of his time regarded leviathan as a real animal, and not a mythological beast. To summarize the main resources which were penned prior to the development of the word dinosaur in 1842, most feel that leviathan was a real creature, even if its grand, fearsome status was mythologized a bit in its usage in poetry. The Jews who translated the Hebrew Scriptures into Greek and Aramaic seem to equate leviathan with two other creatures, tannin and rahab (LXX: cf. Job 3:8; 9:13). The Apocryphal books again contradict the canonical text when they refer to a beast that is shut up until the end times. How else would Job be able to consider this creature if he had no experience with it? While there is no clear consensus among these texts, it can be stated that they mostly considered it a real creature and could have narrowed its identity down to either a crocodile, a whale, or a serpent of some kind. We will now consider the clues in the biblical text to see if we can identify leviathan. We should be reminded at this point that the word leviathan is found six times in the Hebrew OT, three of them are used in a truly figurative sense, and all of them are used in poetry. With that in mind, we see that this creature flashes forth light (Job 41:18), and out of his mouth go flaming torches; sparks of fire leap forth (Job 41:19), and again, a flame comes forth from his mouth (Job 41:21). But we also see that the voice of the LORD flashes forth flames of fire in Ps. 29:7. Nobody would claim that God is a literal fire-breathing creature, because this obviously speaking metaphorically and in an exaggerated sense to get across the point that God is powerful and above His creation. In the same way, this could be said of leviathan; that it is a powerful creature, who provoked fear at the sound of its voice. By reason of biblical analogy, there is no need to rush into the interpretation that this is a literal fire-breathing monster of some sort. As with the behemoth, there are sprinkles of literal truths regarding leviathan in these poetic passages. First, it should be noted that this is a creature that spends most or all of its time in the water (Job 41:31-32; Ps. 104:26 cf. figurative use in Is. 27:1 and Apocryphal use in Enoch 60:7-9). Second, its body is very well armored (Job 41:13-17). Third, it has limbs (Job 41:12), and can raise itself up (Job 41:25). Finally, it is fearless when being attacked (Job 41:1-10a, 26-30, 33). When the poetry is accounted for, at first thought, a crocodile of some kind does seem an attractive interpretation. There are a few things, however, that are still a bit unsettling about strictly and exclusively calling leviathan a crocodile. 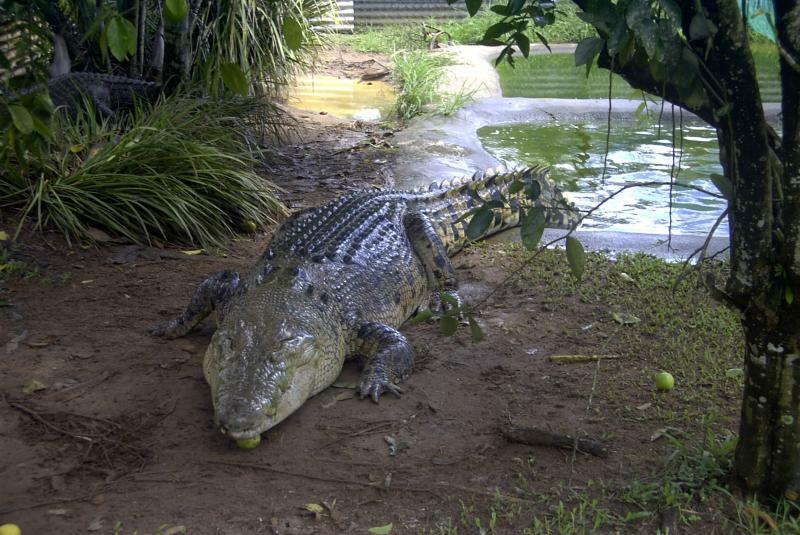 To start, that Ancient Greeks had a word, krokodilos, to describe a crocodile. If the Jews wanted to describe a crocodile for leviathan, they could have used krokodilos, but they did not. That word is not found anywhere in Scripture. Instead, they chose drakon, a word with nearly as much mystery as leviathan. We cannot escape the fact that these were Jews who translated the Hebrew Scriptures into Greek. They would have been most acquainted with the traditional view on this creatures identity. Also, a crocodile by itself does not fit the clues given in Ps. 104:26. There, God is said to have formed the leviathan to play in the sea, great and wide, where ships go. It is very rare to see a crocodile in the open sea where ships go. And a crocodile is not in view in Is. 27:1. Even though this is talking figuratively about Israels sin, the prophet qualifies his use of leviathan with the fleeing serpent, and the twisting serpent. The Hebrew word here for serpent is nachash, which is used for an ordinary snake. To say this simply is just a crocodile leaves so much biblical data unaccounted for. It seems best in conclusion to consider that the ancient writers observed here regarded leviathan as the same creature as the tannin and rahab, and those equal with the drakon (LXX). It appears, when all the biblical data are on the table, that leviathan is, just as its name implies, a creature that twists, who lives in or spends most of its time in the water. While this is an underwhelming conclusion, it is the best we can do, because it seems obvious that the biblical writers and translators had more than one creature in mind when using the term leviathan. In the narratives, it could be taken as a whale or large sea creature (Gen. 1:21), or, more commonly a snake or serpent of some kind (Gen. 3:1-2, 4, 13-14; Ex. 4:3; 7:9, 10, 12, 15; Num. 21:6-7, 9; Deut. 32:33, etc). In poetry, it could be a mythologized sea creature (fig. Ps. 74:13-14; Is. 51:9), a literal great sea creature (Ps. 148:7), a snake (fig. Is. 27:1), or the crocodile (Ezek. 29:3; and as apparently here in Job 41). Possibly the writers chose the name leviathan to exaggerate, in effect, a literal creature for which another, less fearsome name existed. We may never know the true identity of leviathan, but it appears that more than one creature is in view from all the uses studied here. In that sense, the word seems more categorical rather than one that refers to a creature bound by our current taxonomy. We still have yet to answer the question of whether leviathan could have been an aquatic dinosaur such as a kronosaurus or some other plesiosaur. With all the evidence seen so far, it should be clear that the ancients, and most modern scholars, feel this was a creature, or creatures, that Job and the other OT authors would have been familiar with. Any mythological inferences depicted in Scripture can be explained away when we see that all of them occur in the poetic and prophetic Books. In the narratives, it appears leviathan is an everyday, if formidable, beast. To say, then, that a dinosaur is in view in Job 41 is to be entirely inconsistent with the rest of Scripture, and its historical translation and interpretation. The extra-biblical implication of claiming this is a dinosaur is that humans and dinosaurs would have co-existed, possibly even until today. This matter will be addressed on the next page. It should now be clear that the ancients regarded leviathan and tannin as the same creature or creatures. The Hebrew word tannin is found 16 times in the OT, and the first two uses make it clear that more than one creature is in view. Gen. 1:21 says that, so God created the great tannin (sea creatures) (cf. Ps. 148:7). In Ex. 7:9 God tells Moses to Take your staff and cast it down before Pharaoh, that it may become a tannin (serpent) (cf. Deut. 32:33; Ps. 91:13). That the tannin is most definitely here a serpent is noted in Ex. 7:15 where it is equated with nachash, the Hebrew word for a common snake. Surely no one would suggest Moses staff turned into a great sea monster. The term then is so inclusive as to describe a large sea creature, and a snake. In the poetic and prophetic Books, tannin carries a stronger mythological tone, possibly after the Ugaritic cognate tnn, which refers to a mythological sea monster (TWOT). It is seen figuratively as a dragon that is in the sea, equal to leviathan in Is. 27:1. It seems Ezek. 29:3 and 32:2 would figuratively describe Pharaoh as a Nile crocodile. It is also used figuratively to denote God's most powerful opponents, whether natural (Job 7:12) or national (Babylon: Jer. 51:34; Egypt: Is. 51:9; Ezek 29:3; 32:2.) (TWOT). The LXX has translated drakon in Ex. 7:9-10, 12 (ophis in 7:15 for nachash); Deut. 32:33; Ps. 74:13; 91:13; 148:7; Job 7:12; Is. 27:1; Ezek. 29:3; 32:2. It has translated kete (large fish) in Gen. 1:21. The Greek word drakon has been touched on briefly above, but it can be used for a wide variety of creatures including serpents, sea creatures, jackals, young lions and male goats. Clearly, this word does not help us identify the tannin. Kete, on the other hand, refers to the great sea creatures created on Creation Day 5, leviathan in Job 3:8, rahab in Job 9:13; 26:12, and the great fish that swallowed Jonah in Jon. 2:1-2, 11 (presumably one of the creatures created in Gen. 1:21). Let us now clear up the confusion regarding the translation jackals. The Hebrew word for jackal is tan. In plural form it is tannim. Note the similarity with our word tannin. This has caused confusion in passages like Ezek. 29:3 and 32:2 where the Hebrew Masoretic text reads tannim instead of the contextually obvious tannin. The Aramaic Targum Jonathan has the correct reading tannin, as does the LXX (drakon), indicating the Hebrew text contains a scribal error. Conversely, context demands tannim (jackals) in Lam. 4:3, but the Masoretic Text reads tannin (although the Qere [what is read, rather than what is written] reads tannim]). The King James Version has perpetuated this confusion by rendering tannim as dragon or whale throughout the OT. Modern English versions have correctly translated as jackals. In conclusion, the tannin appears to be the same creature, or creatures, as leviathan, which could refer to any number of beasts, most likely a great fish, whale, crocodile or serpent. There is no biblical evidence that this refers to a dinosaur-like creature. This section will be similar to the previous discussions on leviathan and tannin, which seem to all refer to the same creatures. The Hebrew word rahab is found six times in the OT, and generally means pride. The ESV transliterates in all six instances. The KJV translates strength in Is. 30:7, proud in Job 9:13 and 26:12, and transliterates in Ps. 87:4, 89:11 and Is. 51:9. The LXX reads paraklesis (Is. 30:7), huperephanos (Ps. 89:11, kete (Job 9:13; 26:12) and the transliterated Raab (Ps. 87:4) (It is not found in the LXX of Is. 51:9). Again, since all six occurrences are in the poetry and prophetic Books, it is extremely difficult to identify if this is a real creature, a mythologizing of a real creature, a figurative use for God's enemies, or potentially all of the above. In the uses where it could be speaking of a literal beast, there is no reason to deviate from the previous interpretations on leviathan and tannin, where a great fish, serpent or crocodile is in view. There is certainly no evidence here that rahab is a dinosaur-like creature. This subject was covered already on the Fall/Curse page, but the topic will be addressed again here. The Hebrew word here for serpent is nachash, and it is the term used for an ordinary snake. It is used 29 times in the OT. But here in Genesis 3, there is something peculiar about this ordinary snake. It is possessed by Satan (Rev. 12:9; 20:2). Taking this passage in Genesis 3 ultra-literally, many Young Earth Creationists (YECs) say that the serpent originally walked upright and was doomed to crawl on its belly upon God's cursing in Gen 3:14. If that is the case, maybe this ordinary serpent was more of a dinosaur-like creature originally, before it was sentenced to crawl around like the snakes we are familiar with today. Let us explore what exactly happened in the cursing of the serpent in Genesis 3 to see if this idea has any merit. First, the serpent is here referred to as crafty (Gen 3:1). This is the Hebrew word arum. It is used only 12 times in the OT. TWOT indicates the term can mean crafty either in a positive or negative sense. However, the LXX translation phronimos usually carries a positive connotation in most of its 41 occurrences. It may seem obvious to think of the serpents craftiness as a negative trait, especially when referred to in 2Cor. 11:3. The word Paul uses in that text is panourgia though and not phronimos. Panourgia is used exclusively in the NT in a negative sense, and indeed Philo described the serpents craftiness with panourgia, but the LXX translators chose phronimos which is positive. In the NT Jesus instructs His disciples to shrewd (phronimos) as serpents and innocent as doves (Matt. 10:16). It is hard to imagine Jesus telling His disciples to be crafty like serpents if a negative connotation was in view. Though the serpent may have used his craftiness for evil, it appears it was an inherently good trait he possessed. This reference by Jesus to the craftiness of serpents tells us a few things about the nature of the serpent in Genesis 3. First, the serpent did not lose his craftiness when cursed for it still existed in Jesus' day. Second, if that is true, then we know that this is no ordinary snake because snakes are not known for their craftiness today, nor do they speak. It appears that this passage is not describing the encounter between Eve and a snake, but rather Eve and the one who is indwelling the snake, namely Satan. This will be a key observation when discussing the effects the curse on the serpent has, if any, on present-day snakes. The curse against the serpent is spelled out here in Gen 3:14-15 in a three-fold manner. The first part of the curse is uttered on your belly you shall go. Many have taken this to be a morphological change regarding the locomotion of the serpent. That is, originally the snake had legs and walked about until here where it was sentenced to slither along on its belly. There is no doubt that that is the most straightforward literal reading in the English translation. But is that really the intended message of Moses to his original audience? First of all we have already seen that this pericope so far has not been about a snake but the one who embodies the snake, namely Satan. Certainly Satan does not slither along on his belly today, so either this curse is truly meant for the snake or it is not to be taken literally as a physical one. The former does not make much sense in the context of the passage and certainly seems unfair to the snake. The latter may then be taken as a sense of shame. Satan was to figuratively crawl away defeated, much like the snake he embodied. The second part of the curse reads dust you shall eat all the days of your life. The Hebrew audience knew quite well that snakes do not actually eat dust. To take this literally would quickly encounter contradiction in the natural world today. Therefore, like the first part of the curse, we are to take this figuratively as a sense of shame and defeat. This is attested in Micah 7:17 where the nations against Israel will lick the dust like a serpent when they come trembling before Yahweh. Interestingly, Is. 65:25 is often seen as a picture of when the conditions of Eden are restored and the curse is lifted. In this verse the prophet speaks of a time when the wolf and the lamb will graze together and the lion will eat straw like the ox. But he goes on to say that dust will be the serpents food. In Genesis, the serpents dust eating is a product of the curse. This puts the Edenic restoration interpretation of Is. 65:25 in jeopardy. Rather this verse should be seen as prophesying a new era in the future and not a time when pre-Fall conditions will be restored. The final part of the curse against the serpent is given in verse 15, I will put enmity between you and the woman, and between your offspring and her offspring; he shall bruise your head, and you shall bruise his heel. This curse looks forward to a time when a male child of the woman, Eve, will fatally bruise the head of the serpent. The male child is Christ, and the casting of the ancient serpent (Rev. 20:2) into hell will be the fatal blow (Rev. 20:7-10). This curse was clearly brought on Satan and not the snake itself. To summarize this section on the serpent of Genesis 3, it should be clear that the curse applied to this serpent was applied not to the literal body of the serpent, but to the one who embodied the serpent. Scripture tells us this was Satan. These curses were given to Satan to figuratively show his ultimate defeat by Jesus Christ. There is therefore no biblical basis whatsoever to understand this serpent as anything other than a literal slithering snake, much like the ones we encounter today. To say, as most YECs do, that this was some sort of dragon or dinosaur contradicts other such passages that refer to dragons as we will see below. We have already noted that dragons are mentioned in the Scriptures. The English word comes from the Greek word drakon, which was used rather liberally in the LXX to translate leviathan and tannin, as well as a few other normal creatures such as jackals (explained above), male goats and young lions. Drakon is, however, not used to translate the Hebrew word nachash (snake: found in Genesis 3), rather ophis is employed. Drakon is found in 11 passages in the NT, all in Revelation, all used as a distinctive term for Satan. We can conclude from the words usage that it can be used to describe a snake, as in the one Moses' staff turned into, or more commonly, it refers to a larger twisting beast, mythologized in the poetic passages. It is used figuratively for God's enemy, Satan. Unfortunately, the King James Version transliterated dragon in several places, which has perhaps described an ordinary creature to a modern culture which perceives the dragon as a huge mythological beast similar to a dinosaur. The ESV has translated dragon in only 3 of the KJVs 22 OT uses. Twelve of the 22 KJV occurrences were incorrect translations of tannim (jackals). Modern English versions do, however, continue the term dragon in the KJV tradition where it speaks of Satan in the Book of Revelation. This dragon in Revelation is clearly identified as the ancient serpent in Rev. 12:9; 20:2. The Greek term here for serpent is ophis (snake: referring clearly to the ophis in Genesis 3). To summarize the occurrences of dragons in the Bible, most were incorrect translations where jackals were the intended creatures. The remaining occurrences describe not a dinosaur or dragon in our understanding of folklore, but either a literal snake, alligator, whale or other large sea creature (see leviathan, tannin and rahab above); or it is also a powerful figurative term used for Satan. It is commonly held by YECs that dinosaurs were created on Creation Day 6. For the most part, I would agree with that statement. But there are some unknowns which make this blanket statement problematic. For instance, were aquatic dinosaurs created on Day 5? Probably so, and so were the flying reptiles. The main difference between what the YECs are saying and what I have presented elsewhere on this website from the Scripture is the length of the Creation Day. I have shown on the Creation page and the commentary on Genesis 1 and 2 overwhelming biblical evidence that the Creation Days were indefinite in length, but much more than 24 hours in duration. Thus the possibility exists that dinosaurs were created on the same Creation Day, but potentially millions of years before Adam. Sound biblical exegesis prohibits us from using our 21st century English speaking biases towards our experiences and our modern definitions of words, to rush into the Young-Earth interpretation on scripture. If that interpretation is correct, it should stand up to an in-depth study of the passage in the original language, considering the culture and understanding of the original recipients. In my study, I have found that it does not. The Bible presents too many clues to suggest that God's Creation Workdays were not of the same length as our days (see the Creation page for more details). So I would agree with the YECs that dinosaurs were created on Days 5 and 6. But there is no biblical reason to suggest that Adam would have seen one. Thus they may have existed before he was created. We must not read things into the Bible, but rather let the Word of God speak for itself. In keeping with the idea that there was no animal death before Adam's Fall, YECs claim that the originally created dinosaurs would have been vegetarians. This is based on Gen. 1:29-30, where God gave certain plants, trees and fruits as food for Adam and certain animals. The text here is very generalized and this is by no means meant to be an exhaustive menu. They also claim that meat was not given as food until after the Flood (Gen. 9:3). Again, this is a careless bit of eisegesis (a reading into the text) because the text only says, every remes (small reptile or rodent) that lives shall be food for you. This is likewise not meant to be an exhaustive menu. The YEC interpreters have gone too far beyond the text here to promote their idea of original vegetarianism. The Bible is clear that Adam's Fall brought death to humans, and only to humans (Rom. 5:12; 1Cor 15:21-22). For much more detail on this, please see the Fall/Curse page and the commentary on Genesis 3. To summarize this topic, there are no clues in the Bible as to what dinosaurs may have eaten, and it goes too far beyond the biblical text to assume they were vegetarian. For a better handle on their diets, we may therefore turn to the fossil record which would seem to indicate very plainly that some dinosaurs were not vegetarians. These questions are very difficult to answer from just the biblical text. The YEC camp would suggest that Noah's Flood was global in extent, and that it killed most of the dinosaurs except for the few, they say, that Noah would have taken on the ark. It should be noted that this interpretation is necessary for the YECs because they believe also that the dinosaurs were recently (~6,000 years ago) created, lived alongside man, and did not die before Adams Fall. The only thing that therefore could have happened to the dinosaurs is for nearly all of them to perish in a worldwide cataclysm. To understand if this is a viable interpretation, we must again practice sound exegesis when looking at the Flood narrative in Genesis 6-8. When that is done, we see no place where every animal from the remote parts of the planet had to come aboard the ark, let alone dinosaurs. The ark was big, but that is not proof alone that dinosaurs were on board. In fact, there is sufficient evidence given in Scripture that the Flood did not cover the entire earth, and therefore could not have been responsible for the collection of dinosaur bones we see in the fossil record. For much more detail on this, please see the Flood page and the commentary on Genesis 6-8. If the YEC interpretation has backed them into a corner that does not fit the evidence, it is because the previous interpretations that led them there are not correct. Note the inconsistencies along the way. They suggest behemoth was a dinosaur that survived the Flood. The Bible suggests that this was the chief of God's work (Job 40:19). They fail to answer the question of why God would have taken His prize creature on the ark to escape the Flood, only to have it go extinct shortly afterwards. Surely no one suggests the dinosaurs live at this present time. But if Noah's Flood did not kill off the dinosaurs, what did? Since we are getting our answers in this section from the Bible, we must be honest for now in saying it does not tell us how they went extinct. I would suggest that if the Bible is silent on the issue, we may turn to non-biblical sources to find the answer as long as the answer does not come back to contradict the Bible. If thats the case, our answer is wrong. In this lengthy review, we looked in detail at the various direct and indirect biblical references people have claimed speak about dinosaurs. We have found that the majority of sources that predate 1842 when the word dinosaur was coined, considered the passages in question to refer to an ordinary creature that exists at the present time. They considered the behemoth to be either a hippopotamus or an elephant. They considered leviathan, tannin, rahab and even the Greek drakon to be the same creature, most likely a serpent, crocodile, whale or some other large fish (or possibly all of the above). There was found no biblical evidence to overrule their interpretations. In fact, since they were most familiar with the creature, and the language of the literature involved, and since they were unaffected by the current bias towards dinosaurs, it is their descriptions which must carry the most weight. Additionally, the serpent indwelt by Satan in Genesis 3 was found to be just an ordinary snake. The curse issued by God was intended solely for Satan, and thus did not affect the physiology of the snake. There is no biblical evidence that this was a dinosaur that turned into a snake when cursed. We then discussed the indirect references some have claimed must include the dinosaurs. While I agree that they most likely were created on Creation Days 5 and 6 (even though there is no direct mention of them), I do not find any other part of Scripture we can even suggest as applying to them. The Young-Earth Creationist arguments of their original vegetarian habits based on Gen. 1:29-30 and 9:3 are unfounded and careless bits of eisegesis (reading into the text). The claims that they were on the ark, and that the Flood was responsible for the vast dinosaur fossil record is also un-Scriptural. We need to remember not to add to God's Word, and if no mention is given, none should be infused. When all of the passages in question are examined in detail, we find no mention of a dinosaur or dinosaur-like creature. There is no place where we could even infer dinosaurs or their activity. While this may not be the conclusion you have heard before, or expected, it is the only one we can arrive at biblically. In addition to adding to God's Word, the other real danger in insisting dinosaurs are mentioned in the Bible is the implication. If one claims any of these passages talks about dinosaurs, they are left with the necessity of having dinosaurs and humans alive at the same time. If the Bible makes no specific claim that humans and dinosaurs interacted, then we must find evidence of that in the natural world. We will address that on the next page. In closing, we must also consider the reason Scripture was given to us in the first place. It was not given to satisfy our curiosity about large beasts that lived in earth's past. It was given to show us the Creator and reveal to us, His creation, how we might have a relationship with Him through His Son. Copyright 2009 The Stones Cry Out. All rights reserved.